Any coffee lovers here? 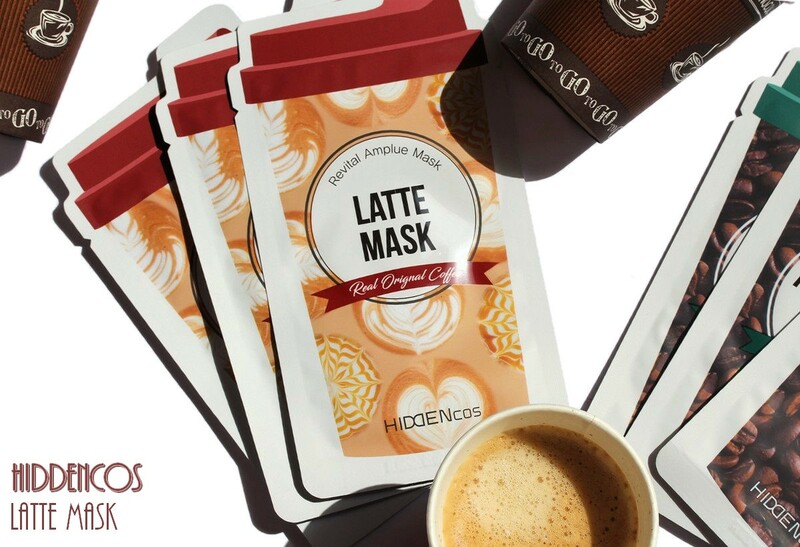 because you will love the HIDDENcos coffee masks, they smell like real coffee! Amazing, isn't it? 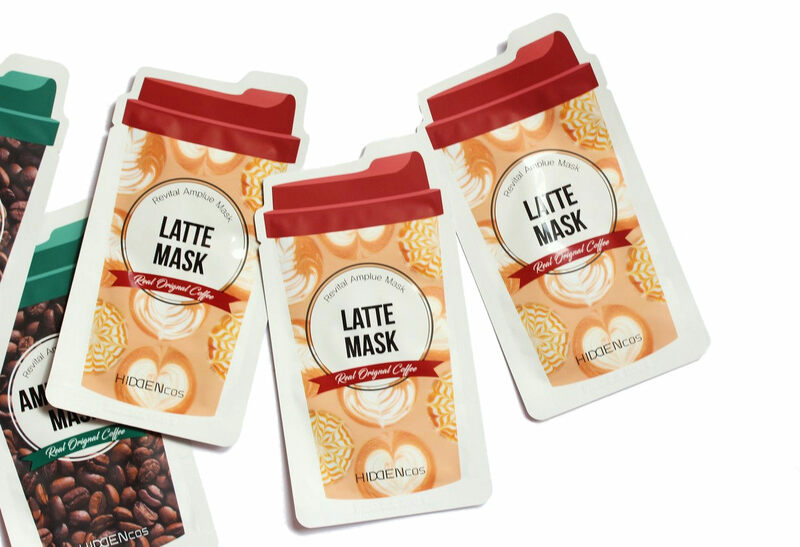 I got these sheet masks for review from jolse.com. They come packaged in a box containing 10 masks and cost USD 15.98 (USD 12.78 at the moment). 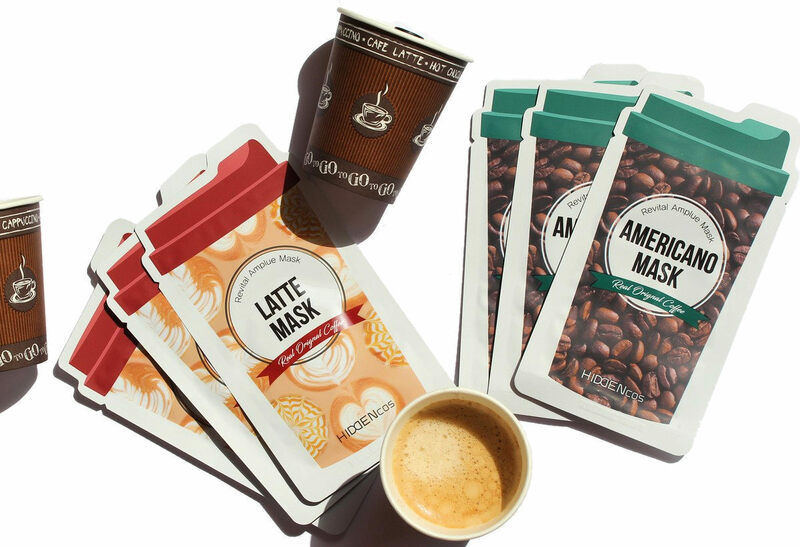 I'll start by reviewing the Latte mask! Cost: USD 16.98 (USD 13.58 at the moment) for 10 masks on jolse.com. Type of material: thin and transparent mask soaked in essence (is it sarcandra fabric, it seems so). There wasn't much essence left in the packet. Type of essence: watery essence with a slightly beige tint. The mask is really soaked in this thin essence and I was able to wear it for about 40min. 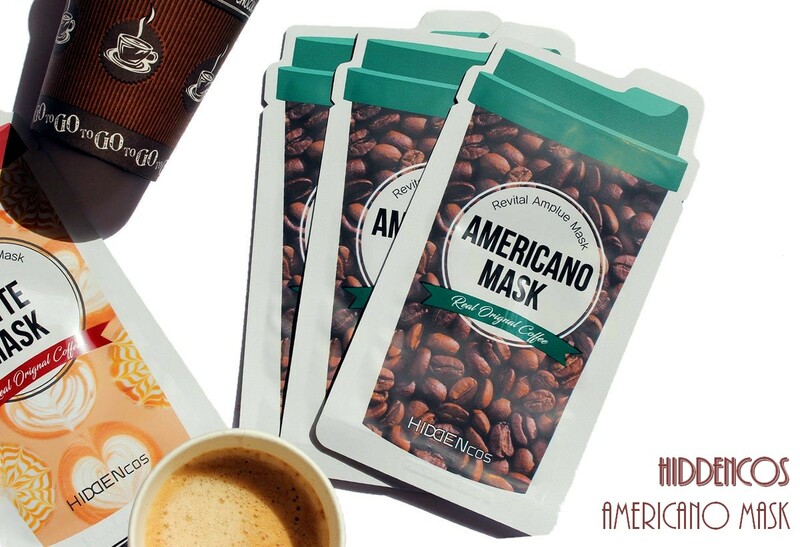 Scent: there is a real strong caffè latte scent with notes of caramel. I think you can really smell the caramel notes and honestly, this is delicious. It's exactly like if you were drinking a caffè latte! That's one of the most interesting point of the mask in my opinion and why I love it so much! Water, Dipropylene Glycol, Glycerin, PEG/PPG-17/6 Copolymer, Niacinamide, Betaine, 1,2-Hexanediol, Sodium Hyaluronate, Hydrogenated Lecithin, Canola Oil, Olea Europaea (Olive) Oil, Polyglyceryl-10 Oleate, Methyl Gluceth-20, Bis-PEG-18 Methyl Ether Dimethyl Silane, Coffea Arabica (Coffee) Seed Extract, Juniperus Communis Fruit Extract, Ascophyllum Nodosum Extract, Aloe Barbadensis Leaf Extract, Althaea Rosae Flower Exract, Portulaca Oleracea Extract, Carbomer, Arginine, Xanthan Gum, Macadamia Ternifolia Seed Oil, Ceramide NP, Squalane, Cetearyl Alcohol, Adenosine, Dipotassium Glycyrrhizate, Caramel, Caffeine, Propanediol, Caprylhydroxamic Acid, Disodium EDTA, Potassium Sorbate, Citric Acid, Fragrance. · a couple of other plant extracts, such as juniper berry extract (soothing), a brown alage (Ascophyllum Nodosum Extrat) that is antioxidant and emollient, aloe vera (soothing), rose (soothing and antioxidant but can be sensitizing), macadamia oil, which is emollient. So ingredient-wise, high in the ingredient list you have mainly humectants (retain water and therefore bring hydration), niacinamide for a brightening boost, 2 plant oils (canola and olive) for moisture, coffee and other antioxidant plant extracts as well as soothing extracts. So yes, pretty good! My skin was left smooth and brighter. I could see a notable glow! The mask feels also very hydrating. 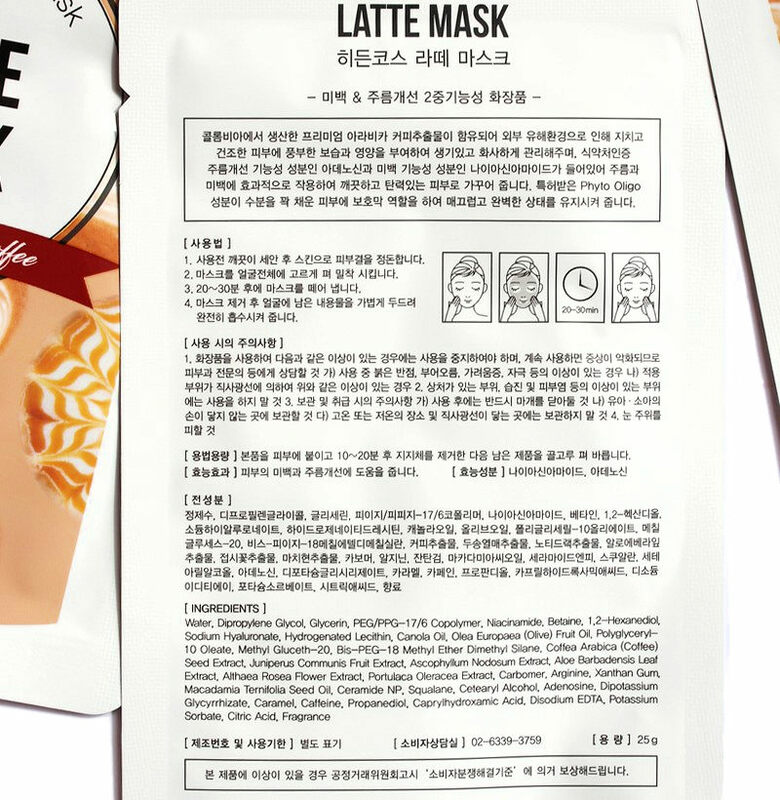 So yes, I'm really happy with it and for me the main points of the mask are hydration and brightening plus the delicious caramel-coffee scent! I could repurchase it easily (and I will probably to do it sooner or later)! Cost: USD 15.98 (USD 12.78 at the moment) for 10 masks on jolse.com. Type of material: thin and transparent mask soaked in essence. There wasn't much essence left in the packet. Type of essence: watery essence with a stronger beige/coffee tint. Scent: it also has a strong coffee scent but it's a bit different than the latte version, the caramel notes are less strong, it is still sweet and yes, very coffee-like. 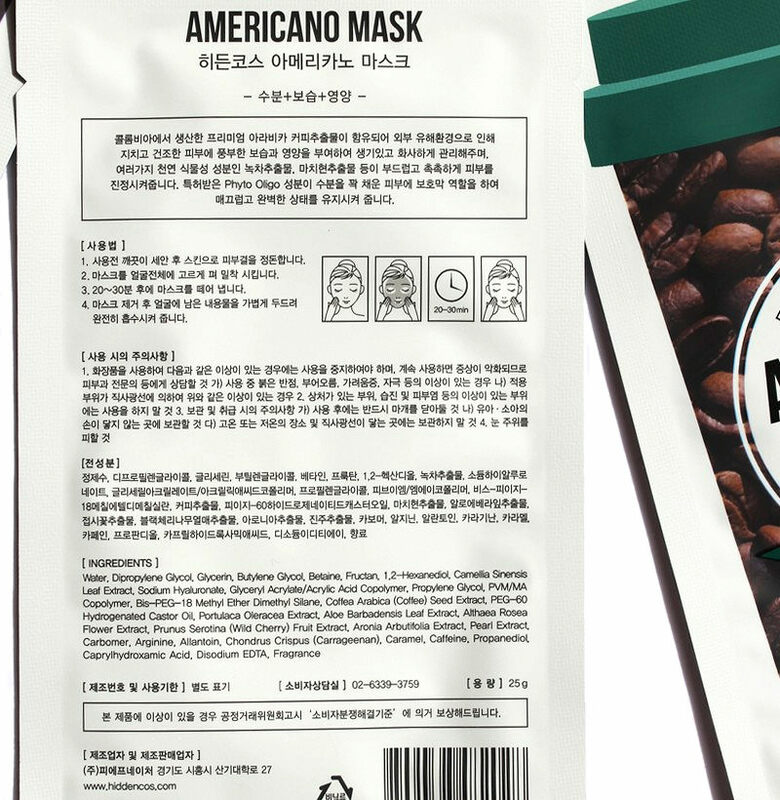 I thought the ingredients would be more similar between the 2 masks but they are quite different, of course you also have coffee extract and I guess they are at about the same concentration in the 2 versions. The 2 versions also contains a good amount of humectants (because that the main point of sheet masks) and betaine. 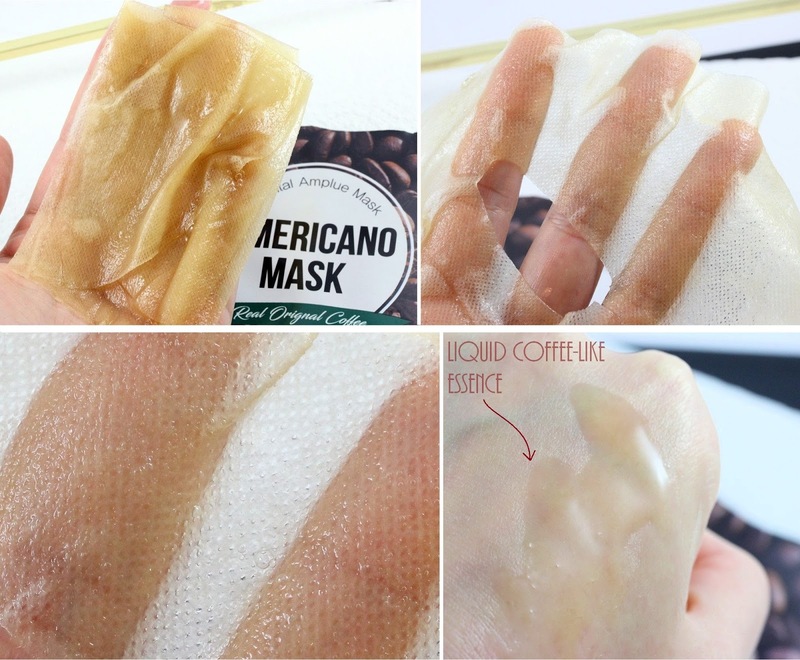 The difference is that there is no niacinamide in the Americano version, but you have fructant, a sugar with moisture binding and skin-softening properties instead. You have green tea leaf water which is rich in powerful antioxidants that help protect the cells from the oxidative stress that ages the skin faster. Canola and olive oils are replaced by castor oil, another plant oil that is emollient that can enhance the absorption of other cosmetic ingredients. Later in the ingredient lists, instead of juniper berry extract and the brown alage, there is wild cherry (antioxidant), Aronia Arbutifolia Extract (antioxidant), and Pearl Extract. Pearl extract is believed to be able to reduce skin discoloration and lighten uneven skin tone but there aren’t many research about it. 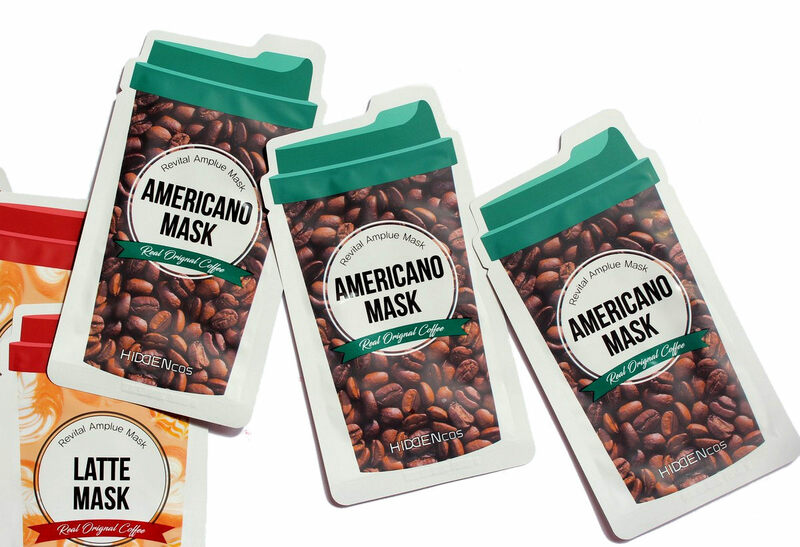 In terms of effects, I think both masks provide the same type of results, the Americano one feels slightly more moisturizing and the Latte one more brightening but the difference is not huge. They both feel very hydarating and make therefore the skin more plump and elastic and smoother. 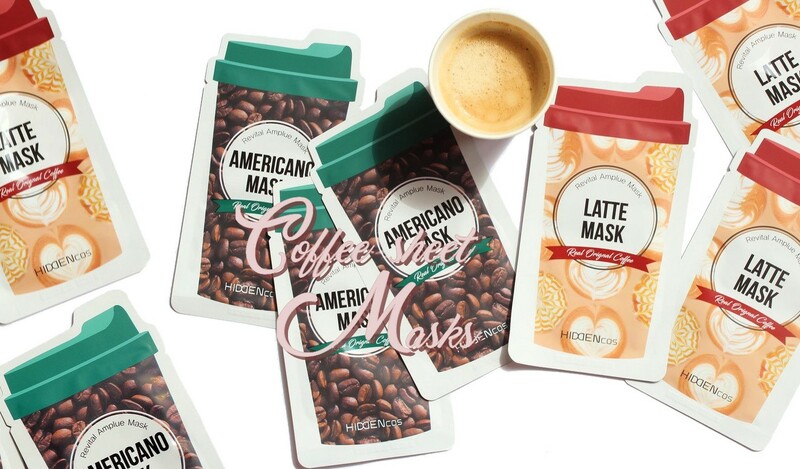 Personally, I will repurchase the Latte masks because I have the impression that the caramel coffee scent gives me a comforting feeling, especially in winter, and I really liked the deep hydration it provides and the brightening effects! 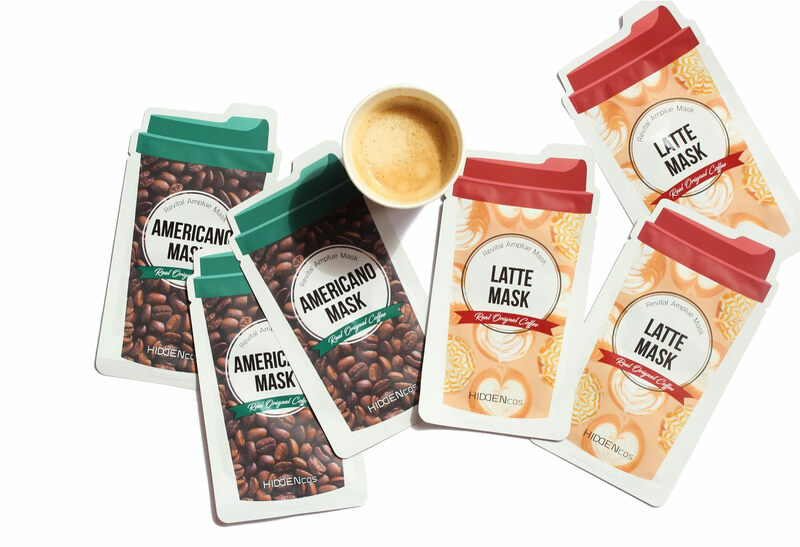 Hiddencos masks can be purchased from jolse.com: Latte mask, Americano mask. Encore un superbe post ma belle !